Getting an AAC championship home game would be a logical next step. A New Year’s Six Bowl Game. It certainly isn’t low-hanging fruit this year as both Cincinnati and UCF figure to be picked ahead of Temple. Even if the Owls won the AAC, scheduling Bucknell could prove to knock them out of an NY6 game–this year either the Fiesta Bowl or the Peach Bowl–just like the ill-advised Stony Brook game probably had a big hand in knocking the AAC champions out of the Cotton Bowl in 2016. Had the Owls then scheduled, say, an ACC team or another (good, not average) Big 10 team and beaten them, they would have had at least as compelling a resume as unbeaten Western Michigan did. That’s probably the strongest argument for dropping all FCS opponents going forward, at least from Temple’s perspective and maybe the league’s as a whole. Still, the Owls now have a coach who has beaten the Big 10 in four of the six games he has played them and more talent here than he did at his last stop so he should not be afraid of asking Pat Kraft to upgrade the non-conference portion of the schedule and that, combined with another AAC championship, is what this program should strive to accomplish. If not this year, then certainly next when the Owls should be stronger and UCF and Cincy weaker. There was a lot of talk on Saturday at the various aptly named fun-fest stops about the current and the future of the Temple football program but, to get an appreciation for where we are now, it is a worthwhile endeavor to reflect upon the last decade or so. There was no one more optimistic than me on that December day in 2005 that Al Golden was hired but if you told me one … ONE … of these things would happen in the span of 10 years I might agree it was possible. I’d have to say you were crazy. Sharif Finch suckers Hackenberg into a near pick six. Beating Penn State: This I would have believed the most. Temple had come close many times before in this series but just never got to the finish line. Getting this monkey off the back, though, might have been the most satisfying of the five boxes we’re checking today. Having a capacity house of 70,000 fans (more Cherry than Blue in the stands) cheering their heads off for something that has not happened since 1941 was awe-inspiring. Having Temple be the team showing mercy to Penn State by taking four knees deep in Nittany Lion territory when it could have scored easily to make it 34-10 made it that much better. Al Golden no doubt was watching this day. I wonder if he saw his photo? Being the focus of ESPN’s College Football Game Day: Not only were the Owls the focus, but the thousands of cheering Temple fans that filled Independence Mall made it one of the more iconic Game Day shows in that program’s history. Mix in a national TV game between then No. 21-ranked Temple vs. No. 9 ranked Notre Dame that night in 2015 that went down to the last play and that was the topper. If the Owls ever won a game they lost (24-20), that was it. It was the second-highest rated college football game on TV in 2015 and the Philadelphia rating of 18.2 (higher than most Eagles’ games) made it the most watched college football game in Philadelphia of all time on ESPN. Having the National Defensive Player of the Year: Maybe the most difficult needle to pass through is getting a Temple player a prestigious national player of the year award but, in 2015, Tyler Matakevich squeezed through it by getting both the Chuck Bednarik and Bronco Nagurski Awards as national defensive player of the year. Getting Two NFL first-round draft choices: In Mo Wilkerson and Hasson Reddick, the Owls have had two first-round draft choices in a span of five years. More, obviously, to come–maybe this season–but that’s pretty good stuff. Winning a championship: Winning the AAC is not a national championship, but it’s darn good. The year the Owls won their league, 2016, Navy beat Notre Dame (28-27), Cincinnati beat Purdue (38-20), Memphis beat Kansas (43-7) and Houston handed Oklahoma one of its only two losses (33-23). 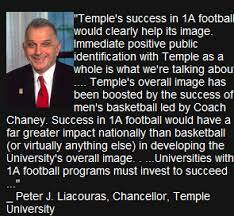 Temple, though, was the team in that league which hoisted the championship trophy of that league. Hopefully, there’s more of that kind of hoisting to come. Usually, you don’t think about offensive linemen being thin but, certainly, the ranks of the offensive line thinned considerably with the loss of former Chestnut Hill Academy standout Darien Byrant to a transfer on Monday. New OL coach Joe Tripodi said last week that his primary concern was getting eight offensive linemen ready to play and that he had eight. We hope he wasn’t including Byrant among the eight because he now only has seven ready offensive linemen going into the season. Byrant could not crack the starting lineup in two years but the Owls have an outstanding first-team group of center Matt Hennessy (6-4, 295), guards Jovahn Fair (6-2, 300) and Vince Picozzi (6-4, 295) and tackles Isaac Moore (6-7, 305) and Adam Klein (6-5, 264). This might be an area to scour the JUCO ranks for an immediate signee as Bryant’s departure has freed up a scholarship. Defensive backs know who the good wide receivers and quarterbacks are so, when Keyvone Bruton was asked on April 6th what player on the entire team has stood out the most, his mention of quarterback Anthony Russo was an eye-opener: “I know he was good last year but, this year, he’s just on a different level as far as throwing the ball, knowing the offense.” Toss in the fact that new head coach Rod Carey has said backup Todd Centeio has established himself as reliable and Trad Beatty is just behind him makes the Owls much more solid in this position than they have been in years. Russo’s TD/Int ratio should improve by getting away from Dave Patenaude, who used the pass to establish the run. Carey’s offenses have always used the run to establish the pass and that’s where Russo’s skill set should shine. Carey also said that wide receiver Isaiah Wright would be “moved around a lot” to utilize his explosiveness. A lot of people have interpreted that to 15 carries a game and a couple of pass receptions but, to me at least, putting Wright full-time at running back makes the most sense. Up that to 20 carries a game and the Owls will be that much more explosive because they have the luxury of play-makers at wide receiver like Branden Mack, Jadan Blue, Freddie Johnson, and Randle Jones. The Owls have no such depth at running back although Jager Gardner and Tyliek Raynor should be able to split the remaining carries. A guy who came out of nowhere this spring is Valley Forge Military Academy product Trayvon Ruley, where he was a two-time conference MVP. While there is an open competition for the starting cornerback position, Temple is the only team among the 130 in FBS with two returning cornerbacks who have had returned interceptions for touchdowns (Christian Braswell versus UConn and Ty Mason versus Tulsa) and they might not even be the best cornerback on the team because Linwood Crump Jr. has the most experience. Baylor transfer Harrison Hand will be in the mix if he gets the OK from the NCAA clearinghouse. If you thought the defensive line was good last year, it just might be better this one and that’s despite losing NFL draft choice Michael Dogbe and underrated interior run defender Freddy Booth-Lloyd. Starting ends Quincy Roche, Dana Levine and Zack Mesday return but will be pushed by JUCO phenom Nickolos Madurie (6-6, 230), who had 17.5 sacks in his last full season. Interior is solid with Karamo Dioubate (6-3, 295) and Dan Archibong (6-6, 285). Depth here, like on the OL, could be an issue but that’s something the coaching staff has time to address between now and summer camp. Departures have freed up a couple of scholarships and this might be the time to grab a couple of JUCO impact linemen. Even without that kind of insurance policy, you have to feel sorry for Bucknell and maybe even Maryland and Georgia Tech. On the same day the Sixers and Phillies got embarrassed, Temple football won. The Owls always win on Cherry and White Day. Since 1894 or thereabouts, the Owls have never lost on the middle Saturday in April. If they had an opponent who wore some color other than Cherry or White, it would be the most impressive streak in sports. For the past 40 years or so, I’ve been to just about every one of these days and I can not remember walking away thinking the Owls did not look good. Some of the days were bitterly cold and a couple of recent ones featured driving rain. At least the weather (78, sunny) this time was good. This time, though, was a little different. I got that vibe early when the public address announcer said the Owls would “simulate” a punt return–with the returner catching the ball and evading two guys who did not even attempt to tackle him. Then they went to a drill with the quarterbacks throwing the ball into the end zone to wide receivers. The only thing missing were defensive backs trying to knock that ball down. New head coach Rod Carey certainly has his way of doing things and it’s way too early to know if this is a good way or a bad one. It certainly limits the number of injuries the team has in the spring but, at some point or another, the players are going to have to put on the pads and start hitting and punt returners will have to evade guys with ill intent and quarterbacks will have to thread the needle over the outstretched fingertips of safeties and cornerbacks. Hopefully, they will get enough of that done in the summer practices. Put it this way: Former head coach Geoff Collins had a much more “game-like” Cherry and White experience last year and lost to Villanova in the opener. Whatever he did, it did not prepare the kids for the opening day. If the guys who were playing a glorified version of pitch and catch on Saturday get off to an unbeaten first month, Carey’s way will be a better one. That is the litmus test of how good this team will be, not what happened on Saturday. Unlike the Sixers on South Broad Street, there was not a single boo to be heard on North Broad. Plenty of room for a football stadium here and it will be one for at least a day tomorrow. As many of you have noticed over the last few years, the Cherry and White game we’ve all known and loved has pretty much devolved into a glorified practice. Sometime after Brandon McManus left, we did not see any field goals and that was followed by no kick returns after Matty Brown left and no punts after Alex Starczyk left. There hasn’t been a real sack in one of these games in 20 years with the quarterbacks off limits. The game never really meant anything even before that but it was football and looked pretty much like the real thing. Each time, though, the reminders were that the Cherry and White game was not a Cherry and White game but a Cherry and White day. Getting rid of the game is one thing but getting rid of the day would be unacceptable. That’s why what new head coach Rod Carey has done is a good thing, not a bad one. It’s been a practice for at least a good decade now so why not call it what it is? The goal of this whole exercise of spring ball is to get ready for the bad guys and having game conditions exacerbates the risk of injury to the good guys, something Carey found out early in his career at Northern Illinois. What is this new offense for which Anthony Russo speaks? Just about every article talks about Russo and his teammates learning a “new” offense but not a single one I’ve read (and I think I’ve read them all) says just what the new offense is? Wishbone, triple option, spread, run/pass option, pro set? You think at least one reporter would have asked that question by now. We should get a good look on Saturday. Wouldn’t that be a nice spot for the new stadium? There will be thousands of Temple fans there and not one protester that they are there. The neighbors on the Broad and Master area are used to Temple hosting nearly 100 games in three sports at that site and the world did not end. They probably would not object to putting a football stadium there and having the uni use it only a half-dozen times a year. What will Mayhem be replaced by? There were a lot of defenders woefully out of position, particularly on gouging running plays by opposing offenses the last two seasons. That will always be Mayhem to me and not the good kind. Temple fans should get a new appreciation for the term “staying home” on defense with the first clues coming tomorrow. After that, though, it’s a long time before we see Temple football players in full uniform so appreciate the day, if not the game. Fortunately, despite all of the turmoil in one section of the Edberg-Olson Football Complex, the coaching offices, Temple avoided it in the larger part of the facility, the locker room. Until the last few days. First, the Owls got the news that kicker Aaron Bouhmeri was leaving and then, on Monday, wide receiver Sean Ryan announced via Twitter that he was leaving for West Virginia. When you go to war, you want to go to it with all of your soldiers and those were two POTENTIAL starters. In both cases, though, there were reasons that deserve some illumination here. One, Boomer–as responsible for the 2016 American Athletic Association championship as anyone on the team–was perpetually injured with a nagging hip flexor. He played a couple of games in 2018 but could not go on and there was a school of thought that he would be ready to kick in spring ball. He was not and that did not make the new staff comfortable that he would be able to go in the fall so they are in the hunt for another kicker. I must admit when Austin Jones was the victim of a cheap shot at Memphis, the Owls were cooked for that season but who would have known that Boomer would hit 15 of 17 field goals and be just as good as Jones? Boomer will always have a special place in Temple lore. The Ryan case is different. Isaiah Wright says he will carry the ball in the backfield this season and I think he will be turn out to be so valuable there that this coaching staff will have no choice of keeping him there even though they are talking about moving him all over the field. That, plus the star of last year’s spring game (Jadan Blue) returns to catch passes with the breakout star of the regular season, Branden Mack. Add to that the fact that Randle Jones and Freddie Johnson need receiving reps and that wide receiver room is so crowded they might have to knock down the walls. As a certain government official says about the country, we’re full there and there is no more room. I think Ryan saw the handwriting on the wall and left for West Virginia. I don’t know what he expects to find when he gets there, but he knows what is here and he decided he did not want to fight for reps. One thing I’m certain of is Troy’s Neal Brown is every bit the head coach Rod Carey is and will give him as fair a shot as Carey would have. Anytime players leave, though, you wish them well and hope that they don’t regret the decision. Meanwhile, it’s going to be harder to find a kicker with range than a backup wide receiver so we’re hoping Rod Carey and his staff have someone in mind. One of the few constants over the last 40 years of Temple football is the support of the football alumni. That is guys who played on winning Temple teams in the past and want nothing but the same for the players of the present. Even in the days of the 20-game losing streak and 20-plus losing seasons, a group of players set up in the Jetro Lot. Coaches come and go but the players’ loyalty has always been constant. That’s why around this time of year of any coaching change keeping an eye on how the new guy treats the ex-players always portends the future. Al Golden and Matt Rhule embraced the Temple tradition. Steve Addazio pretty much ignored the ex-players and everything Geoff Collins did screamed that Temple football started in 2005, not in 1894. Fortunately, it appears Rod Carey has listened to Rhule where Collins did not because Carey has embraced the ex-players from all different eras with open arms in his first alumni day on Saturday. Carey seemed genuinely interested in getting to know the guys who played for Temple and the coaches who they played for. Contrast that to Collins who, upon first meeting Paul Palmer, had no idea who he was. “Who do you coach for?” Collins asked. Players know who is a phony and who is not and Carey passed the smell test up close on Saturday. From all reports we’ve heard, the practice they saw was a crisp one with no time wasted on things like having the band play or putting a solid contributing running back up in the DJ booth and celebrating that. There was no guitar playing. Only football and getting work done. After two years of mostly nonsense, it was a refreshing change.